The sweat is breaking down your face. The intense, throbbing pain emanating from your head – maybe from the centre of your forehead, maybe from one side – is so vindictive you can’t think, or even see clearly. Your body’s defences are coping with just blurring the pain for you. Even if that means not being able to keep your food, or even a sip of water down. Likely, you’ve thrown up at least once or twice already. Often, you see a bright light, or aura, surrounding your field of vision. If you’ve experienced one or more of these symptoms regularly, chances are the dreaded migraine monster has struck. For those of you who live with this health condition, the onset of the above symptoms is a dreaded event that you know you have to weather. For although there are various treatments available for managing migraines, none have been proved to provide permanent, long-term relief. Migraines are medically defined as episodic headaches along with light or sound sensitivity, and nausea. Auras – and, in particular, visual auras – are seen in about 10-20 per cent of patients. And, you know it’s a migraine and not a regular headache because it often occurs only on one side of the head, while other tension-headaches occur on both sides. Just by “virtue” of gender, women also make up the larger share of migraine sufferers, at a ratio of 2:1, no thanks to a combination of genetics (a woman doesn’t just look like her mother, but gets her health issues too) and hormones. Surprisingly, another demographic is comprised of children and teenagers – it’s a myth that “kids don’t get headaches”. “In children, it is often under-diagnosed because they often project migraine pain in the tummy. In fact, 50 per cent of the cases diagnosed affect those who are below the age of 20,” reveals Prof Dr Krieger. Besides the aura, a person may also have sensory symptoms like flashing lights, blind spots, numbness or a tingling in the face and hands, among other symptoms. 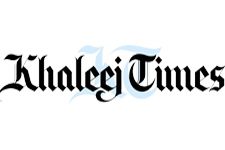 “Some could also experience irritability, depression or food cravings, even before the onset of a migraine,” says Dr Alkaznaji. Much more dreaded are the longer migraines that last a few days. While some people have migraines that last over a day or two, anything that goes over 72 hours is medically termed a ‘status migrainosus’. “This form is rare, but can occur if the treatment is not sufficient, or even if medication is overused,” says Prof Dr Krieger. After an episode is over, fatigue and general exhaustion are likely to linger on, warns Dr Alkaznaji, so you still need to take it easy for a day or two. 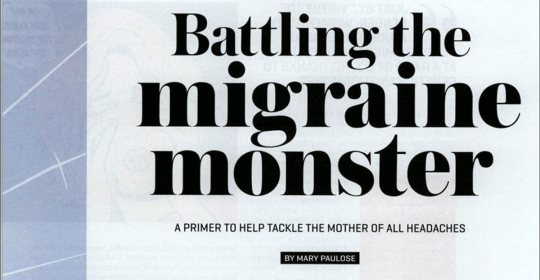 For regular migraines, Prof Dr Krieger recommends medication, mostly as preventive measures. Another surprising treatment method is the use of Botox injections to relieve pain! Only severe cases are prescribed this method though, which works by injecting certain migraine-prone spots in the head, neck and shoulders with botox, thus ‘numbing’ these areas. The UAE was one of the first countries to try and popularise this treatment method. Secondary migraines are rare (only 2-5% of sufferers experience them), but brain imaging with MRI scans is recommended in patients with every onset. The best way to treat migraines is to undergo lifestyle monitoring and change, according to both doctors. “Patients should keep a ‘headache diary’ and adjust their lifestyles, keeping their specific triggers in mind,” points out Dr Krieger. “Practising relaxation methods – whatever suits you, like meditation, mindfulness or physical exercise like yoga – also help alleviate symptoms, but only if done regularly.” Dr Alkaznaji suggests keeping a regular daily routine with set times for meals, complemented with exercise and enough sleep. Doctors advise seeking medical attention if your migraine symptoms only get worse over time, as they could be indicative of an underlying condition or something more serious, like brain damage or irregularities. “Watch out especially for headaches that worsen with movement, or come on suddenly, migraines accompanied by fever or seizures, or headaches that start after an injury,” warns Dr Alkaznaji. 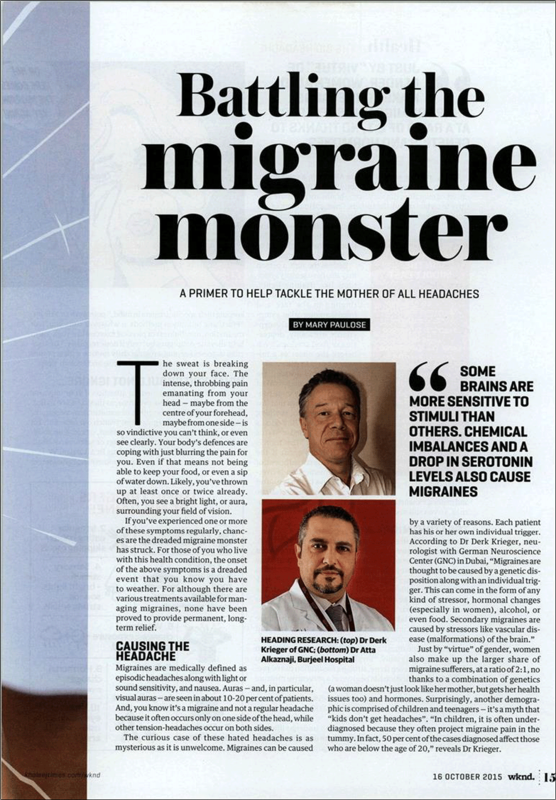 Although there are no official health figures or data on migraines for the UAE, some studies suggest that this region has the highest prevalence of migraines in the world, according to the doctors we interviewed. This is most probably caused by a combination of genetic predisposition as well as environmental factors. In the UAE, stress and lifestyle causes, like lack of sleep, certain foods and drinks, or skipping meals, are seen to be the main causes of migraines.